← Are Carotenoids Protective of Depression? Turmeric (Curcuma longa) is a spice that has been used historically in both Chinese and Ayurvedic medicine. Turmeric belongs to the ginger (Zingiberaceae) family of plants, and as with ginger, the rhizome or root of the plant is prized for its medicinal properties. The main phytochemicals present in turmeric root include one of the active ingredients, curcumin [(diferuloylmethane)—(1,7-bis (4-hydroxy-3-methoxyphenyl)-1,6-hepadiene-3,5-dione)]. The pharmacology of curcumin has been explored and to date studies suggest that the compound is poorly absorbed from the mammalian gut. Curcumin is actually a generic name for a number of compounds termed curcumoids. 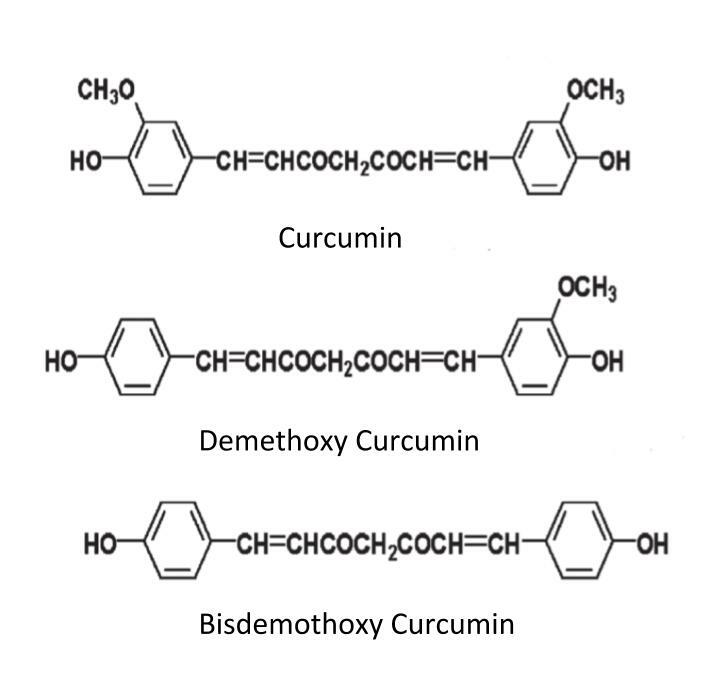 The main curcumoids in termeric include curcumin, demethoxy curcumin and bisdemethoxy curcumin. These curcumoids are metaboised extensively in the enterocytes of the gut and are absorbed as phase 2 conjugates including glucuronides, mainly of demethoxy curcumin and bisdemethoxy curcumin. Curcumin is thought to be the active component of turmeric root that gives it its medicinal properties. Curcumin comprises of a number of chemicals called curcuminoids (also called curcumoids). The main curcuminoid is cucumin, with other chemical forms such as dimethoxycurcumin and bisdimethoxycurcumin also being identified and characterised. Turmeric can be added to foods as a spice, and this was the traditional way turmeric was used as a food component. As a medicine, turmeric is available as a supplement and such supplements are often standardised for curcumoids to provide consistency between supplemnts. It is likely that curcumin metabolites are further metabolised during the first pass metabolism in the liver, leading to further chemical modification. It is also likely that these highly metabolised compounds are responsible for the pharmacological activity of curcumin. Curcumin from turmeric has been shown to possess a number of biological activities including anticancer, antioxidant, anti-inflammatory, anti-viral, antibacterial, anti-fungal, immunomodulatory, neuroprotective and wound healing effects. The ability of curcmin to inhibit angiogeneis, mutation and metastasis in cancer cells and tumours has been demonstrated in cell culture and animal models, and along with its antioxidant activity, may explain the anticancer effect of turmeric. The anticancer effects of turmeric and curcumin may also stem from its ability to increase immune system activation, through for example stimulation of immune cells such as macrophages, monocytes and lymphocytes and through modulation of cytokine biochemistry. This entry was posted in Curcumin, Curcumoids, Turmeric. Bookmark the permalink.